As an Office Manager, there are several settings that you can configure that will affect your office, agents, and listings. Some of these settings will prevent or limit what your agents can do with ShowingTime. Allow Showing Agents to make requests on my office's listings? You can choose to temporarily disable scheduling on your office listings. This setting will hide the ShowingTime Icon from your Office's Listings in the MLS. This filters down to all of your Agent's Listings as well. The default appointment type for a listing affects how the sellers or agents are contacted and confirm showings. Your agents will be able to change the appointment type on their own listings, but newly added listings will take on this type. Notify this office of new appointment requests? Here you can set an address that will be copied when an appointment is made on the office's listings. It is useful for tracking requests for reporting. Notify the listing agent of new appointment requests? You can set your offices listings to only notify the dedicated email address above. The Listing Agent will not be notified of incoming requests if this is set to no. However, allowing your agents to handle their own appointment requests is beneficial. Send feedback requests to showing agent? You can opt not to send the Showing Feedback Request form to the showing agent. You should be sure to inform your owners and agents of this choice. If enabled, the feedback form can be set to automatically send over a period of days. This default setting will apply to all of your office's agents but they will be able to modify this setting in their profile. While you may choose to disable feedback for commercial or vacant properties, feedback is invaluable to a seller. You can set the earliest and/or latest an appointment can be scheduled for your office's listings. Confirmations can sometimes require a little bit of time, or owners may need some default time to leave the home. For example, sellers may want 24-hour notice of an appointment so the listing agent can set a required lead time of 24 hours on their listing, preventing agents from making an appointment before that 24 hour lead time. Setting this lead time here will become the default minimum required time on all of your office's listings. 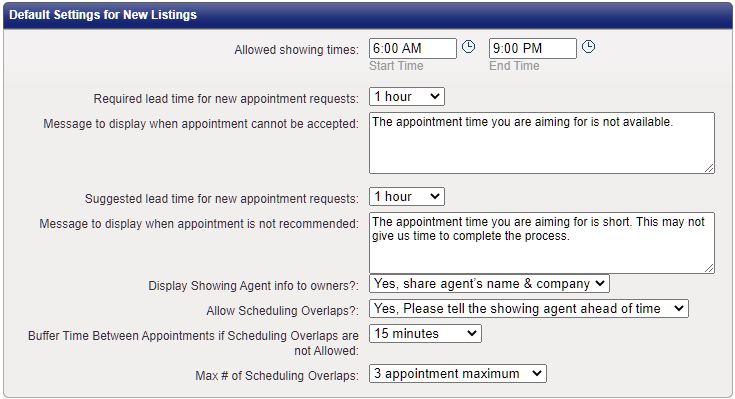 If you have disabled online showing requests OR the minimum lead time prevents a showing, you can provide a message to be shown to requesting agents that will be shown when they hover over the time blocks on the Appointment Calendar. Suggested Lead Time refers to how much notice the listing agent would like to have for appointment requests and is often used for short notice appointments. Setting this time here will apply as the default suggested lead time for all of your office's listings. You can decide to share the Name or Company or Name and Company of the Showing agent with your owners. This allows tracking of who is in their home as well as a way to identify that they are who they say they are when reaching the home. You can also choose not to display this information at all. Some owners may prefer that only one agent is in their home at a time, but for others, the more people that visit means the more likely a quick sale. You can allow only exclusive showings, or choose if you want to inform the showing agents that they may encounter another agent on the property. This setting can also be set on a per-listing basis. If your company is using another scheduling service and appointments need to be forwarded to them, this is where you can add a service key so our system knows not to handle the appointment for you. Removing this key will allow ShowingTime to then again handle appointments going forward. From here, you can see the contact details of all the agents in your office and if they are displaying the Schedule A Showing Icon in the Multiple Listing Service or Public Website. If you click on an individual agent, you can access their showing settings and other profile information. Some features are not available in all markets. You can upload your office's logo.